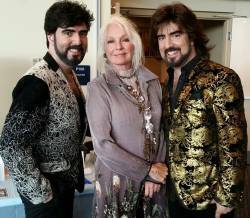 YORKVILLE, Ohio, Jan. 18, 2018 /Christian Newswire/ -- The internationally known twins, the Chrisagis Brothers, have teamed up once again with their long time friend from TV, Movies, and International Modeling career, the first Super Model and Cover Girl Spokes woman for 30 years, Jennifer O'Neill. Jennifer who starred in over 50 classic films and became an overnight sensation in the film that made her the dream of ever man alive the "Summer of '42" has known the brothers for 27 years. They have always clicked together from the day they met each other. Now 27 years later the brothers have put together one of the most dynamic women's conferences with O'Neill entitled "All That Glitters." Stripping away the glam of Hollywood and going beyond the glitter of what Satan baits folks into seeing... actually going to the very core of the heart and soul of what is important. This conference is a one day event that starts at 9:00 a.m. and goes until 5:00 p.m. It is happening Saturday, Feb. 24 in Wheeling, West Virginia at River City Restaurant & Banquet Hall. This time O'Neill teams with another actress from Hollywood, Nancy Stafford who starred in the TV series Matlock and St. Elsewhere, joining the two of them will be gospel singer from the Bill Gaither Homecomings, Angela Primm. These three amazing women will share about breaking blood line curses over your life, what true beauty is, share women's struggles of marriages, divorce, abortion, miscarriages, suicide attempts, abuse, and stories that shocked the foundations of their lives. These workshops have been set up to offer hope, healing, and restoration, and to empower women with the word of God. The Chrisagis Brothers plan on doing more of these types of conferences with O'Neill and bringing other Hollywood women in to share their faith. Keep in touch with the brothers by logging onto their website: chrisagisbrothersministries.org for this event and their upcoming Legends 2018 event that will be on Aug. 18th.